The Pitt-Rivers library catalogue is part of the holdings of Cambridge University Library [CUL]. 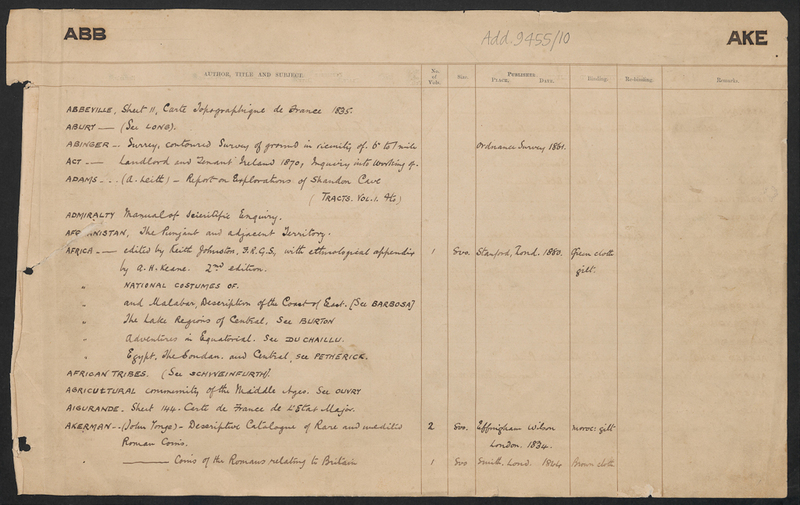 [Add.9455.10], find out more about all of the CUL's holdings for Pitt-Rivers here. The catalogue appears to have been created towards the end of Pitt-Rivers' life, to find out more about it, see here. It is created on loose sheets held in a purpose-made cover. The catalogue is not very precise, the titles of the books are not always rendered correctly and other bibliographic details are missing. It is also interesting that whilst the catalogue contains many anthropological sources of note, many other volumes which you might expect Pitt-Rivers to have owned appear not to be listed. To find a transcribed (and updated) list of his anthropological books only see here. In order to make searching of the books listed easier, two volunteers of the Rethinking Pitt-Rivers project, Farah Qureshi and Christa Gray, worked for many months transcribing the entries, this transcribed catalogue are available via this page below though unfortunately the first half of the transcriptions was not able to be finished because one of our volunteer's time ran out. The image below shows a typical page entry, to see all of the pages please download one of the PDFs listed below. These PDFs were created by Dan Burt of the Rethinking Pitt-Rivers project, we are very grateful to the Syndics of the Cambridge University Library for agreeing to us providing access to them via this page. Below are two excel files of transcriptions of the library catalogue. The first should cover pages 1-199, but is at present only half complete, this half was prepared by Farah Qureshi.The second is for page 200 to the end, L-Z, and was completed by Christa Gray. We are very grateful to both of them for their hard work on this project and hope that we may find another volunteer to complete this transcription at some point, meanwhile complete scans are available in PDF above.